Brussels, The plateau of Aubrac.... Groningen? After writing his letter Joseph Le Perdriel continued his search after the Obscure Cities. The Authorities had forbidden him, according to himself, to leave the town so he put all his efforts on finding a passage in Groningen. The museum, the 5 chimneys, he searched very hard for clues. It is strange to read how he felt about the meetings we had. He knew a lot but if he really found the passage as he claims, I don't know… At least this is the last sign of life I can find of Joseph. A few days after I had published on the Internet that I would continue my investigation despite the counteraction of the Authorities, Hick called, the shopkeeper from Plestarstreet. He had received a letter addressed to me and he asked me to pick it up. It seemed important to him. I rushed to his store in Plestarstreet, where he handed me a pale, yellow envelope. The colour of the paper intrigued me, it was the same colour that I used as a background for my internet pages concerning the Obscure Cities. The following days I didn’t do much, actually I was just waiting for Monday, just waiting for X. On Monday March 10 at twelve o’clock I was waiting behind the old power plant. The factory is out of use and according to the last reportings, it would be demolished. A typical feature of the skyline would disappear with it. A lot of people objected to this demolishing. The five chimneys had become a point of recognition for people who came towards the city. While I was studying the chimneys someone came next to me. “They won’t be there for a long time”, said the man. I looked at him. Next to me was a slim tall man with a pale face and steelblue eyes. We shook hands. “Alphonse Postolheu”, he said. I introduced myself and proposed to go and sit on a bench in the park next to the factory. I showed him my memorecorder and asked him if he would mind if I would record our conversation. “I didn’t expect anything else”, he replied. What follows now is a complete transcription of the conversation that I had with Alphonse Postolheu on March 10. Joseph le Perdriel: You have got information for me about the Obscure Cities? Alphonse Postolheu: Just now, I don’t have any answers for you, at least not on the questions you want to ask. JP: You know the questions I want to ask? AP: You want answers to the questions: ‘Where are the passages to the world of the Obscure Cities? Is there a passage here in Groningen?’ And your most important question: ‘Can I go to the Obscure Cities?’ Those are the questions that bother you, for years actually and that has become worse after watching ‘Le dossier B’. The fact that Henri Vandebelle claims that he has been to the world of the Obscure Cities has made the urge to go there even bigger. JP: You seem to know me well. AP: I follow your investigation with more than normal interest. Do you know who has sent you the videotape with ‘Le dossier B’? JP: No, it was an anonymous letter. AP: Just as anonymous as the letter I sent you last week. AP: You will get some important moments in the near future. Continue your investigation as planned. I have got a parcel for you. Open it when you’re at home. I have to go now. You’ll hear from me again. The man handed me a parcel, stood up and walked away. I was too confused to stop him. The questions I had prepared , I hadn’t been able to ask them. He had directed the entire conversation. I just sat there for a while with the parcel on my lap. I was stunned. Still confused from the conversation with the intriguing Alphonse Postolheu I arrived at my own house and opened the parcel. In the parcel was an art-catalogue, two photos, some kind of a report and a letter. The new museum of Groningen has showed some of the most sensational exhibitions, even though the museum doesn't exist very long yet. But one exhibition, what should have been the most sensational, has never been shown. 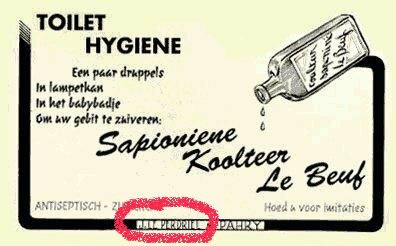 I found this out after examining the catalogue of the museum of Groningen. 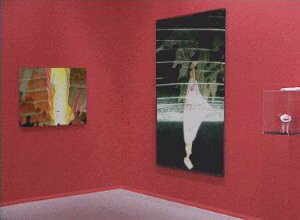 In the catalogue were several pictures of paintings hanging on the walls of the museum. The document said it was a scene of the preparation of the exhibition about a painter who lived at the turn of the century. 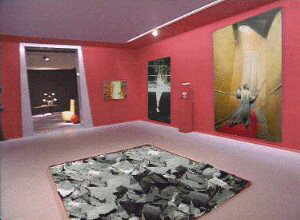 This exhibition was cancelled on instructions of the board of directors of the museum. Very strange because the preparations had costs a lot of money and the cancellation of the exhibition would mean a financial catastrophe. The painter's name: Augustin Desombres, the man who found a passage to the Obscure Cities at the plateau of Aubrac on January 3, 1900. The Belgium authors François Schuiten and Benoît Peeters have described this in their book 'The leaning child'. I was not familiar with the work of Desombres. The themes of his work show an obsession to find a passage and the Obscure Cities behind it.Works painted before January 3, 1900 show that Desombres was already thinking of the parallel world, although subconscious, long before he found the passage at Aubrac. One of his last paintings 'The invention of Crusoe' must be a sign of frustration about the world where he once was and can't return to. Very likely other art-lovers have different explanations of this piece of art, but some servants of the Authorities must have seen a connection between this painter and the Obscure Cities. Otherwise the exhibition wouldn't have been cancelled. Suddenly I didn't find it strange anymore that the exhibition was cancelled. It means that whoever is working on the Obscure Cities, or has any connection with them, will suffer the obstruction of the Authorities. I must confess Alphonse Postolheu had given me information I can use. Although I didn't know how to continue my quest. Alphonse Postolheu urged me to continue investigating, but I must admit that I didn't know what to investigate. The city I live in is a nice city, but I couldn't find anything that could be connected to the Obscure Cities. But then again, as many times before, I got some help from François Schuiten and Benoît Peeters. These two men started to publish their conclusions on the Internet. On their Site www.urbicande.be one can find a lot of information on the matter of the Obscure Cities. Their goal is clear: To make sure that as many people as possible get to know something about the parallel world. Constructing a network of people looking for the Obscure Cities. One thing is for certain. There are a few passages to the Obscure Cities and they are known. There is one in the Palace of Justice and one on the Plateau of Aubrac. But Schuiten and Peeters state that there should be more passages. How many and where is not known to them. The way they reached the Obscure Cities was using the passage in the Palace of Justice. I am forbidden by the Authorities to travel outside the city of Groningen, otherwise I would have travelled to Brussels immediately. My goal is to find an entrance in the city of Groningen. Where that one is? I don’t have a clue. 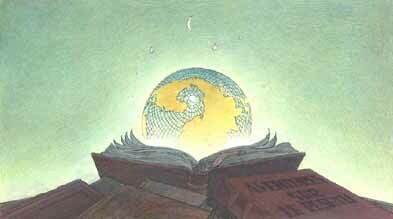 Studying the discoveries of the gentlemen Schuiten and Peeters lasted for a few weeks. My investigation in Groningen was at a low level. I won't discuss the discoveries of Schuiten and Peeters. I wish to direct you to their site: www.urbicande.be. This doesn't mean that I won't make links between their and my investigation. After studying the works of Schuiten and Peeters on the Internet, I started focusing on Groningen again. 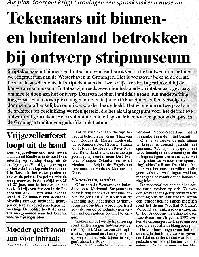 I read an article that mentioned the plans to build a cartoonmuseum in Groningen, using the Museum for European Comics in Brussels as an example. I read the article with great interest, as I am very keen on comics. My state of interest turned into a state of being intrigued when I read that a few important cartoonists had been invited to draw the design of the museum. 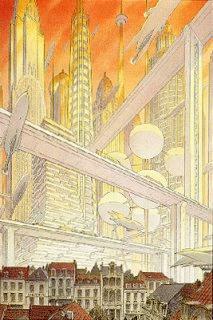 One name swept my strength away: François Schuiten! It was one of the pioneers considering the Obscure Cities who was going to draw a design for the comic museum in my city. A strange feeling got a hold of me, a strange kind of energy. Has this got anything to do with the Obscure Cities, I wondered.. I had started an investigation in Groningen, but it only raised more questions instead of providing me with answers. I wanted answers, I had plenty of questions now. Alphonse Postolheu, hadn't contacted me since our rendez-vous at the power plant. I had so many questions and somehow I had the feeling that he could have the answers. However, I had no idea how to contact Postolheu. I had the feeling my investigation had stranded. The meeting with Postolheu at the power plant. The fact that he wanted to meet me in Groningen and that he encouraged me to continue my investigation, makes me think that there is more to this city than one would think. The planned exhibition of the works of Augustin Desombres, the painter who had visited the Obscure Cities. The fact that François Schuiten was appointed to make the design for the cartoon museum in Groningen. All these things should be clues to prove that there is something going on in this city. Maybe they are clues that lead me to a passage to the other side, a passage here in the city I live, Groningen. If I find it, it will lead me to Mylos, Urbicande, Brüsel, Xhystos, Calvani, the Cities, the seas, a huge continent, the continent of the Obscure Cities. Until now I only had questions, but no answers. I was still stuck. Until one day a pale yellow envelope was put in my letterbox. The letter hed been posted in Brussels with a stamp that drew a smile on my face. 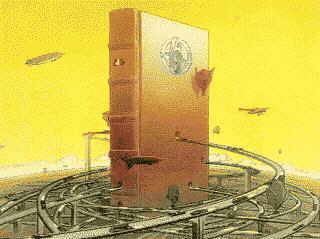 The person who had designed the stamp was no one else but François Schuiten. It didn't surprise me. Only few things still surprise me, which is a thing that surprises me. The letter in the envelope was written by Alphonse Postolheu. I knew the spot in the picture. It was one of the city markings erected on the occasion of the celebration of the existence of Groningen for 950 years. There were nine of these city markings next to all the main roads leading into Groningen. This one was near the railway line going south. I wondered why Alphonse Postolheu wanted to meet me there and especially I wondered what he wanted to tell me. I had the funny feeling that he was playing some sort of a game with me. I decided to prepare this meeting better than the first one. I would ask him a few cunning questions. I would receive some answers for a fact. Well prepared, I waited near the city marking on Monday at noon. 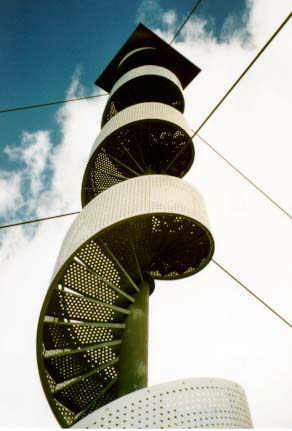 This city marking was named “Stairway to Heaven”. I had brought my memo recorder. This time I would get some answers, instead of more questions. Postolheu came five minutes late and apologised for that fact. We sat down on a bench nearby and I put on my memo recorder. 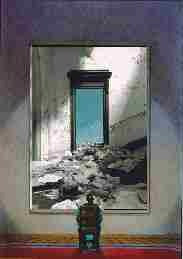 Alphonse Postolheu: Interesting piece of art, isn't it? Joseph Le Perdriel: You know how to pick your locations. AP: Not without a reason. Did you know that this city marking plays a role in the matter of the Obscure Cities? AP: And the power plant as well in some extend. JP: You are telling me a lot of intriguing things. You raise a lot of questions. I think it is time for some answers. AP: Not so fast. The answers will come. Tell me, how is your investigation progressing? JP: Rotten, many questions, few answers. No answers at all actually. AP: Everything has got its own time. But enough chit-chatting, you have got questions and you thing that I hold the answers to those. Ask your questions. I will try to answer them. JP: Is there a passage in this city? AP: What do you think? JP: I am asking you! I am asking the questions here! AP: There is no need to be irritated. I just wonder what you think of all this. Judging on the material you have: Do you think there is a passage in Groningen? AP: You seem quite confined. Why do you think I have the answer for you? JP: You seem to know a lot about this case. I do not only think whether you know if there is a passage in this city, I also think that you know where it is. AP: Well well, You think highly of me. Let me tell you this: You are on the right track. You will find the passage, I 'm sure. But first you will have to answer the questions that you come across. I can help you with advise, but I cannot provide you the answers. You will have to find them yourself. I am leaving now…. Once more, you are on the right track. Alphonse Postolheu went away and left me once again confused. It was as if he had hypnotised me. I had no strength to run after him, no strength to force him to tell me where the passage is situated. I sat there for a while, alone in my thoughts, until a passing train made me come back to reality. It wasn’t really the case of the Obscure Cities that troubled me, after the meeting with Alphonse Postolheu, but it was Alphonse Postolheu himself. Who was this man and what did he know about the Obscure Cities? Was he a cheat who had followed the publications concerning the Obscure Cities? Was he trying to pull a joke? Or was he someone who had knowledge of the position of the Obscure Cities? Did he find a passage? Has he ever been to the continent of the Obscure Cities? Once again I questioned myself many questions without answers. After several days of looking for a solution, I decided to change my focus. I wouldn’t try to focus on Alphonse Postolheu but on the locations where we had met each other. Wasn’t it Alphonse Postolheu himself who said that the power plant and the city markings played an important role in the case of the Obscure Cities? Night after night I spent investigating Alphonse Postolheu’s remark but I couldn’t find any clues. Why would a power plant and nine city markings have got anything to do with the Obscure Cities and a passage to that parallel world? Quite desperate I read a couple of articles concerning these objects. My eye caught sight of an article which stated that the power plant was to be demolished. For a split second the theory came to my mind, but I abolished it immediately. It was too good to be true. What if there was a passage in the power plant? Was the power plant to be demolished because the Authorities wanted to remove the passage? But the thought seemed ridiculous; more buildings are demolished and the power plant wasn’t functioning anymore. I considered the theory to be too farfetched. I couldn’t find anything special about the city markings. I started to believe that Postolheu was indeed pulling a joke, and I fell for it. On 12 April 1997 I went, with my confidence high, to the lobby of the department for territory arrangement, the Dienst Ruimtelijke Ordening, of the city of Groningen. 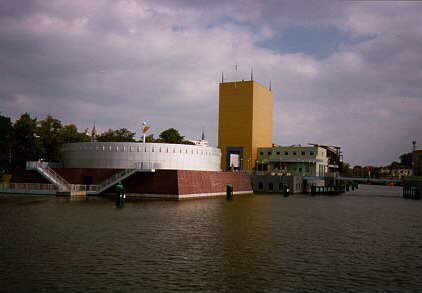 That department is part of the municipal government and deals with the development of Groningen. Therefore it is a part of the Authorities. As many times before I had decided to continue my investigation and was determined to end it in a short period of time. I realised then that my investigation had been going on for ten years and I still hadn’t reached my main goal; that is finding a passage to the Obscure Cities. As I hadn’t heard from Postolheu since our meeting at the “Stairway to Heaven”, I decided to change my approach. In the lobby of the Dienst Ruimtelijke Ordening was a closed meeting that I wanted to join. During this meeting the person would be announced who would receive the assignment to make the final draft for the cartoon museum that will be built in Groningen. 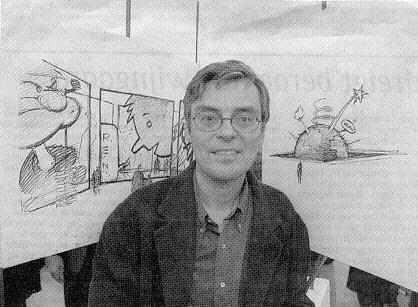 I expected that there would be quite a lot of famous cartoonists and therefore the chance of François Schuiten being there was quite big. I just had to speak with him. It all turned out to be just one big disappointment…… one of so many during my investigation. Schuiten was there, but he was surrounded by many people. I couldn’t even get into the lobby. 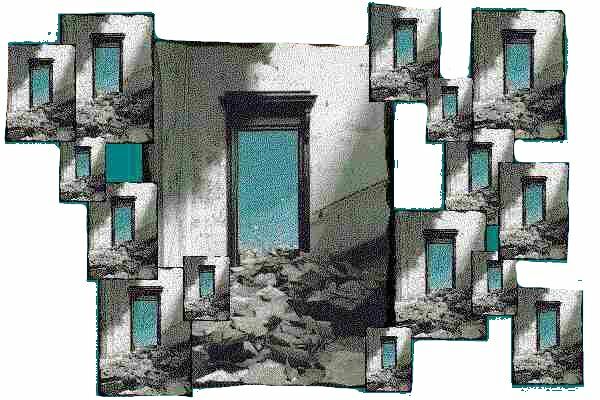 I could only watch through some large windows at the front and saw him talking to several people and among them was Alphonse Postolheu I felt the earth opening under me as I saw him. I began thinking about a conspiracy against me. I believed my whole investigation was nothing but a soap bubble, one big play of which I actor and director against my will. 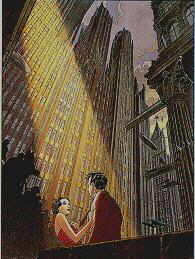 In the evening I saw the news and heard that François Schuiten had been chosen to do the draft. I felt confused. Sometimes I wonder what I am doing. For ten years now I have been investigating, with only one purpose: finding the Obscure Cities. Time and time again I was disappointed. Sparks in this long-lasting research were finding the Echo of the Cities on a fair on the Vossen square in Brussels and finding the works of Schuiten and Peeters. These things just kept me going. Now I've lost all strength to go on. My meetings with Alphonse Postolheu only gave me more questions. On top of that I felt as if someone was playing a game with me. All this makes me feel depressed. I feel as if I had started my work of life, of which I will never know the outcome. Sometimes I wonder why I keep going on. I get counteraction from the Authorities, my private life is ruled by my investigation and I don’t gain anything with it all. I would love to start my life again on the other side. If I might find it…. The last few weeks I have studied all the documents I had gathered throughout my investigation. All publications by Schuiten and Peeters, the videotape ‘le dossier B’, the Echo of the Cities, the masterpiece that started all this: the Archivist and the fact that François Schuiten is to make the final draft for the cartoon museum…..I put it all next to each other. For several nights I studied all documents over and over again, The answer had to be there somewhere, somewhere in the documents. I was possessed by a new kind of urge, a new kind of enthusiasm, Maybe I was fooling myself again and was there no answer in the documents, but I had the strange feeling that only studying the documents would lead to the answers. Right at this moment I am watching the videotape ‘le dossier B’. I have watched it so many times that I know it by heart now. I am convinced that the key is somewhere in three documents: The Archivist, Le dossier B and the Echo of the Cities. That’s where the key must be! I found the key! 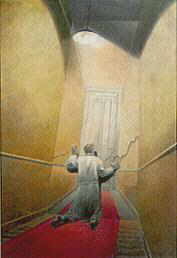 I, Joseph le Perdriel have found the passage after years of searching, depressions and obstruction from all sides! After years my life’s work is done. I discovered the proof that the Obscure Cities exist and I found out how to get there! I would like to quote the person who went before me, Henri Vandebelle: You know, the part where Lidiaux states that his novel (Le dossier B) is just fiction is a plain lie. And do you know why? Because I, Joseph le Perdriel have found the connection after years of investigating. And it is all in the books! I will publish my results on the Internet. In a few days I will finish my complete file, that will astonish the world. Forgive my euphoric state, but how would you do if you had finished your life’s work? For years I have struggled and up to a few weeks ago I thought I’d never find the answers. Now I’ve cleared my mind and I am bursting with energy. I am going on a trip soon…a trip that only few people have made before me and I will let the world share in the knowledge. The knowledge of a parallel world of which most people don’t know anything. I will live on as a discoverer…..my efforts weren’t useless. I will finish my file and go on a journey to Brüsel. I will bring my camera. In a short period of time I will send you images of the other side. Good bye….. I don’t know how much longer I can continue. I try to write down everything I know, to make sure I can save as much as possible……Forgive me my chaotic style of writing……My time is running out…The only thing I want is the world to know what is going on. This evening I read the Echo of the Cities once again…. Just a matter of checking everything again…..I stumble on something that I had overlooked for years….Something that made my heart skip a few beats…….I can not describe what I saw……I will add, if I succeed, a document to this file that speaks for itself………..
For years I had looked for a parallel world…..I drew the conclusion that parallel Cities existed…….Brüsel was a parallel city of Brussels……It didn’t come to my mind that there might also be parallel persons…. The matter of the Obscure Cities has been thoroughly investigated by me the last ten years. It developed from a normal interest into an unhealthy obsession. The last few years I investigated every clue that might lead to my main goal: finding a passage to the world of the Obscure Cities! The fact that the Obscure Cities exist became very clear to me when I got hold of the “Echo of the Cities”. Watching the videotape “Le dossier B” made me change my focus; I decided to focus on the city I live in. Because, if there is a passage in the palace of justice in Brussels, why shouldn’t there be one in Groningen? I frankly admit, that it was a desperate attempt to focus on the city of Groningen. There wasn’t the slightest clue that the city would have anything to do with the matter of the Obscure Cities. Therefore there was no clue at all to which I could conclude that there was a passage in this city. During my investigation, I noticed the important role architecture plays in the works concerning the Obscure Cities. The explorers François Schuiten and Benoît Peeters discovered an entrance to the Obscure Cities in the palace of justice, which is a remarkable building. Knowing all this I started my investigation in Groningen. First of all I focused on buildings in the city that were out of the ordinary considering architecture. 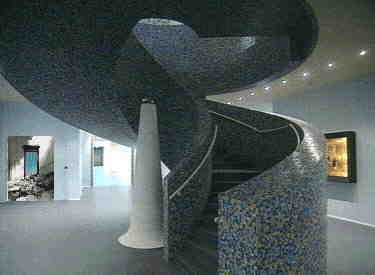 The museum of Groningen was my first goal. And it also provided me with some interesting information: The museum had planned to hold an exhibition about the works of the painter Augustin Desombres, a person who also appears in the works of Schuiten and Peeters. 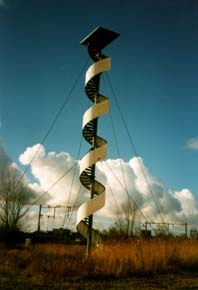 To me it was a proof that there had to be a link between the Obscure Cities and Groningen. After that I focused on the building of the gas company, the National Gas Union. The only thing I discovered was that the Gas Union is the owner of the largest underground pipe-system of this continent. The link with the pipe-system in the Obscure City Urbicande seemed too farfetched. And after some time investigating the city markings, the power plant caught my eye. The best known part of the Groningen skyline except for the Martini tower of course. A thing that has influenced my investigation for a great deal is my meeting with Alphonse Postolheu. A rather weird and puzzling person, of whom I am still puzzled. What is his role in the matter of the Obscure Cities? Does he come from that world? Is he from this side and does he travel to the Obscure Cities every now and then? Or is he just a cheat? Question on which I don’t have the answers, but I don’t think that is very relevant. To me it was clear, also because of some things that Alphonse Postolheu had said, that the passage was at a place that had ‘earned’ it, so to say. And I think that there are only two places here in Groningen that might have earned it to hold the passage inside its walls: The museum of Groningen and the power plant. Then something happened that really surprised me: it was the news that François Schuiten, Obscure Cities pioneer, was going to design the building of the Comic Museum that is to be build here in Groningen, To me there was no way to connect all the clues, let alone this new fact…..Until one day when I had, I think I can say this, a perfectly clever idea, an idea based on intuition. I still can’t provide you with proof….at least for now. It won’t be long or I will give you all the proof you want and I will be able to give it, because I will travel to the Obscure Cities! This is my idea. This is my story that I will proof very soon. 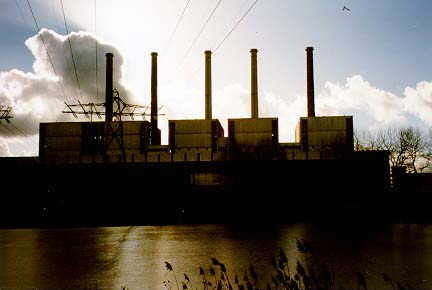 The power plant , built in the fifties, had to provide the North of Holland with electricity. Which is of course a normal function for a power plant. Another function was top secret: On that location is a passage to the Obscure Cities. A fact that has been a secret for many years and the passage would have been lost with the demolishing in January 1998. 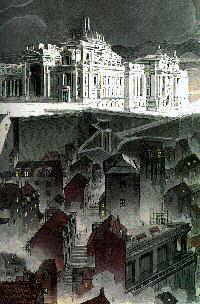 Obscure Cities specialist François Schuiten knows about the existence of this passage and sends Postolheu to Groningen to see what the situation is of the passage. Shocked by the fact that the power plant is due to be demolished, Postolheu tells Schuiten and Peeters that if they are unable to find an alternative, the passage will be lost forever. At the same time they help the young explorer Joseph le Perdriel in a subtle way in his investigation concerning the Obscure Cities. The alternative was found in the Comic Museum that is to be built in Groningen. François Schuiten gets the assignment to draft the plans for the design of the museum and he will not let this chance pass by: He will put a new passage in the museum. What is the role of the Authorities in all this? That seems obvious to me: The decision to blow up the power plant shows that the Authorities are eager to keep the civilians ignorant of the fact that there is a world parallel to ours. Unfortunately for the Authorities there is a strong movement, with François Schuiten and Benoît Peeters as their leaders, that wants the world to know about the Obscure Cities. A movement that I have joined without knowing about it. After Jules Verne, Augustin Desombres, Henri Vandebelle, François Schuiten and Benoît Peeters I will be the next person to enter the world of the Obscure Cities and I will tell you about it. This will be continued in the series: Travelling notes by Joseph le Perdriel.